Sedona is a red rock wonderland. The region is filled with epic hiking, stunning landscapes, relaxing spas, and enough healing crystals and mind-altering vortices to cause New Age enthusiasts from around the globe to make the pilgrimage. Luckily, whether you are eager to center your chakra or finding it shocking that people believe in chakras, you will have fun exploring one of Arizona’s most scenic locales. Simply pack an appreciation for beauty, a pair of hiking boots, and you are destined to have a great time. There are many great things to do in Sedona. Here are some of our favorite activities and hotels to enjoy while visiting Sedona with kids. Although Sedona is filled with eclectic galleries and wonderful Southwestern shopping opportunities, most young children would rather have their teeth pulled than spend the weekend shopping. Get the kids outdoors and enjoy the scenery that made Sedona famous. After you have made the obligatory stop at the Chapel of the Holy Cross and taken in the views of your surroundings, get out there and hike! Sedona features dozens of trails waiting to be explored. A trail that packs quite a bit into its 2.5-mile out-and-back jaunt is the one into Fay Canyon. The trail follows a creek into a forested canyon which offers quite a bit of shade along the way. Trail’s end is at a rock slide, perfect for scaling to take in mesmerizing views of the canyons and landscape beyond. If your kids love to climb, then consider the scramble up Bell Rock. The rock can be approached from either the Bell Rock parking area or the Courthouse Rock parking area, which was my family’s chosen path. A trail from the lot leads to Bell Rock, said to be home to one of the most powerful energy vortexes in Sedona. Don’t stop at trail’s end. Continue to scramble up the side of the massive red rock as far as your brood is willing to go, taking in spectacular views along the way. Tip: Shade is at a premium so bring plenty of water and avoid the peak heat of the day during the warmer months. 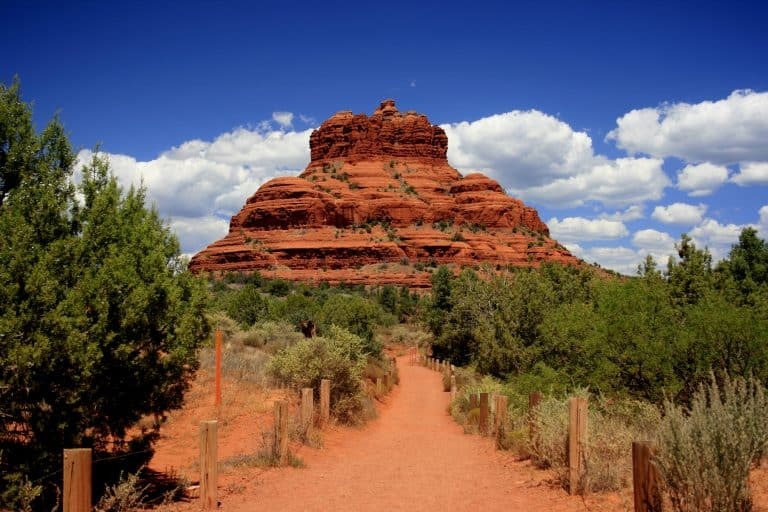 There are some great off-road trails to explore in Sedona with kids. If you don’t have your own 4×4 vehicle, take a tour with one of Sedona’s many Jeep tour companies. Pink Jeep Tours is the most popular and has been in business since 1960. Their knowledgeable guides will keep you safe and entertained during your off-roading adventure. 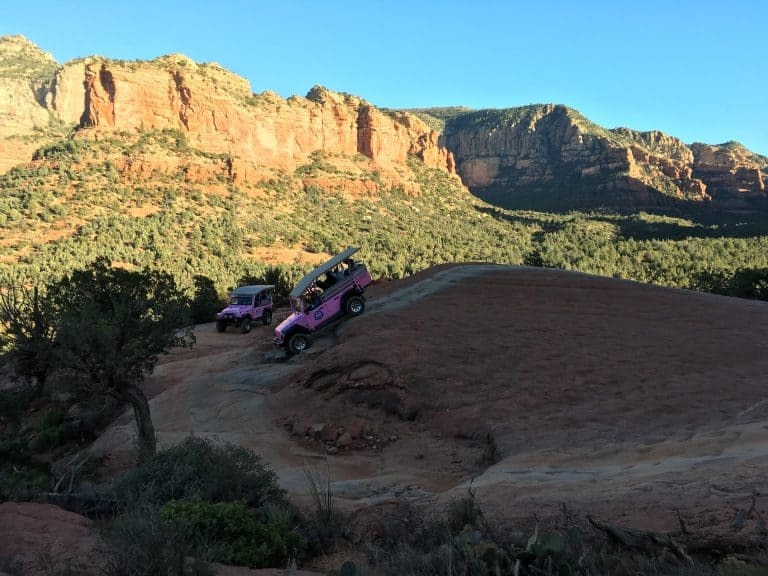 Read all about what to expect on a Pink Jeep Tour. Find deals on family-friendly hotels in Sedona! Since Sedona sits at 4,500 feet, it is significantly cooler (about 10-20 degrees) than Phoenix’s low elevation. Summer months still bring plenty of desert heat, so take early hikes to enjoy the scenery without sweating bullets. Use those midday hours to enjoy your resort’s pool, stroll galleries, or score a big scoop of ice cream at Black Cow Café in kitschy uptown Sedona. Just a few miles up the road, the temperatures are even cooler in Oak Creek Canyon where the forest offers plenty of shade and Oak Creek’s brisk waters are perfect for floating, splashing, and swimming. 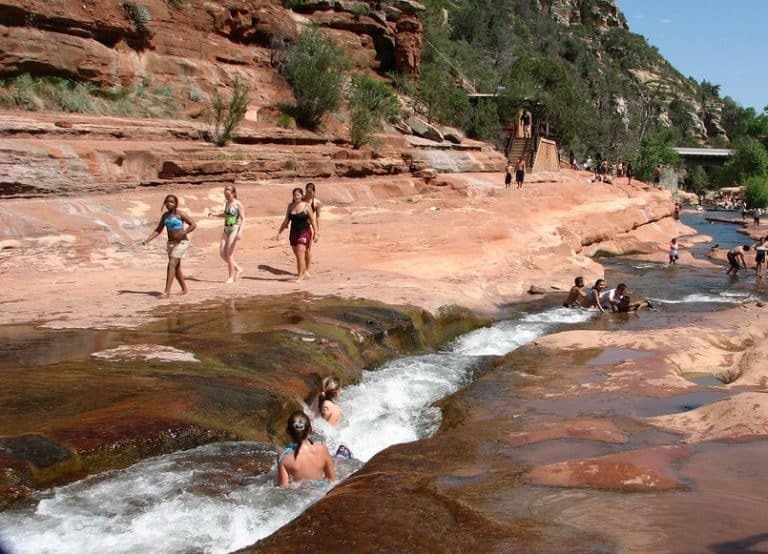 Slide Rock State Park is extremely popular during the summer months due to its natural rock waterslides. The area can become extremely crowded, a bit rowdy, and even polluted during busy summer weekends. We suggest visiting during the weekdays. There are many small cabin resorts up the road, such as the charming rustic cabins of the Butterfly Garden Inn. Enjoy the peace and quiet of these resorts in the forest and play in Oak Creek upstream without the crowds. Flagstaff is a mountain town just up the road from Oak Canyon. Check out all the fun things to do in Flagstaff with kids. The euphoric feelings of outdoor Sedona don’t have to end when you head back to the hotel if you stay at El Portal. This boutique hotel incorporates natural wood, stone, and adobe into each unique room. The atmosphere is friendly and inviting for the whole family, even the four-legged members. 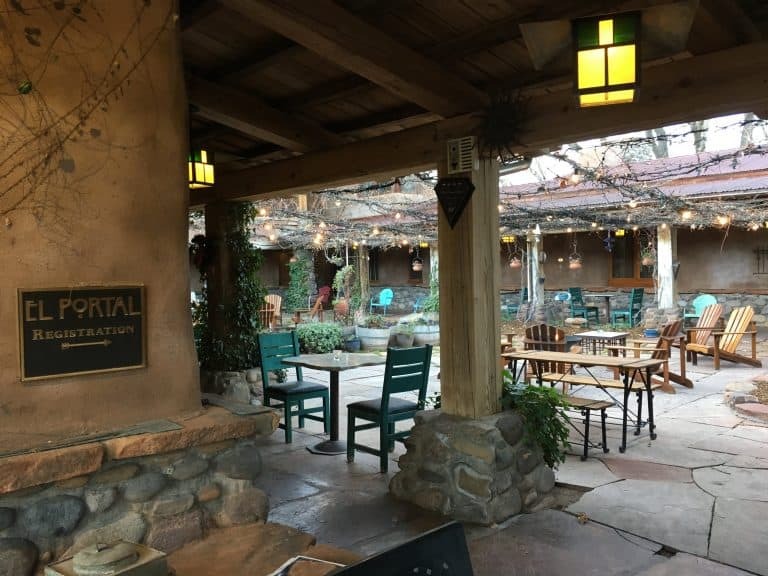 El Portal is conveniently located in the Tlaquepaque Arts and Craft district of Sedona, within walking distance to shopping, dining, and even some trails. Read more about all the El Portal Hotel has to offer. Another great place to spend the night after a long day of exploring the great outdoors, where the “wow factor” is high is at the Hilton Resort and Spa Sedona. Red rock views abound at this resort in tiny Oak Creek Village, which sit near Bell Rock and Courthouse Rock. Beyond the scenery, families will enjoy the property’s spacious suites, on-site golf, and refreshing pools. Check for deals on family-friendly accommodation in Sedona. There are two attractions that people seem to flock to but don’t really scream family fun in my opinion. The first was the Midgley Bridge. Full disclosure: I have a pretty big fear of bridges and falling. Yes, the view from the bridge was nice, but the highway-side parking and “safety rails” partially falling off the side of the cliff were not kid-friendly. The second experience to skip is sunset at the airport. Evidently, this is a thing. People make their way to the top of a butte near the airport, flood a gravel lot with their rental cars, and then crowd an overlook to watch the sunset. I don’t get it. I found sunset to just as nice from our hotel patio and didn’t have to bump elbows to catch a view. My tip: Find a spot to enjoy the sunset along the scenic Highway 179. There, you can enjoy expansive views and soft hues without the crowds. What’s an energy vortex? According to those who believe, an energy vortex is essentially spiraling spiritual energy which affects the inner self. These spiraling energies come out of the surface of the earth in 4 major locations in the Sedona region: Bell Rock, Boynton Canyon, the airport, and Cathedral Rock. 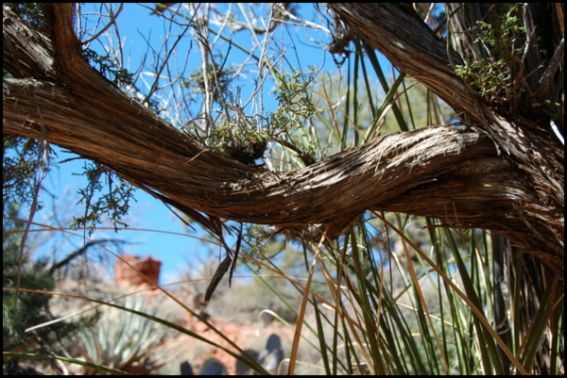 Near the vortices, Juniper trees seem to respond to the energy with a spiral-like growth pattern on the length of their branches. Vortices are said to be masculine (affecting inner strength) or feminine (affecting inner goodness). Are they for real? Well, that depends on who you ask. Head on out to one of the vortices and see if you experience any changes to your inner self. Have you ever wanted to feed a tiger? Get kissed by a giraffe? Watch a lion devour a meal? You can do all of these things at Out of Africa Wildlife Park in Camp Verde. My kids couldn’t get enough of this interactive animal park. Friendly giraffes visited our tram and ate carrots from our mouth. 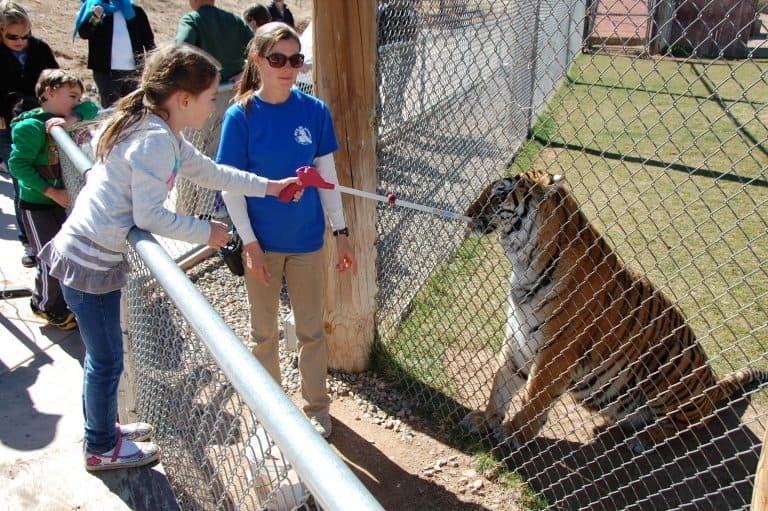 My kids fed tigers a couple of pieces of meat through a fence using a metal arm. It was fun watching animal keepers coax playful tigers into chasing them into a swimming pool filled with water. Predators, such as lions, wolves, bears, and hyenas, worked themselves into a full frenzy as keepers threw huge chunks of meat into their enclosures during feeding time. You won’t get the aesthetics of botanically rich zoological parks such as the world-famous San Diego Zoo, but if you schedule your visit around a feeding day (Sunday, Wednesday, or Friday), you will see more movement from the often sleeping predators than you probably have anywhere else. Montezuma Castle National Monument is just 5 minutes from the Interstate and 25 miles from Sedona, making it a must-visit. This impressive dwelling was carved into the side of a cliff during the 8th century, giving the Sinagua people a cool place to live near the life-bearing Verde River. 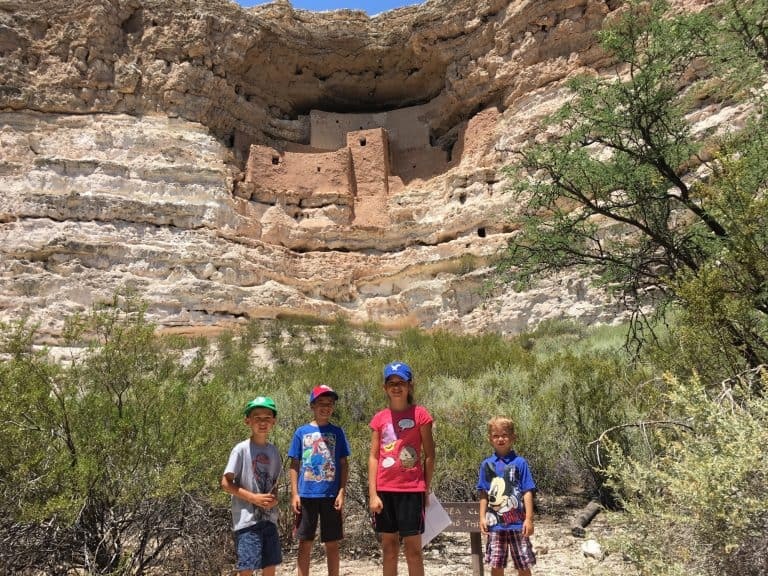 Take time to have your kids complete the Junior Ranger program and earn a Montezuma Castle Badge. Heading to Phoenix? Check our guide on free things to do in Phoenix. Don’t miss the top 10 things to do in Phoenix either! Disclosure: I received complimentary admission to Out of Africa, a complimentary Pink Jeep tour, and a complimentary stay at El Portal and Hilton Resort in Sedona in order to complete unbiased reviews. All opinions are my own. This is awesome! Taking the family to Sedona is on my bucket list. It looks so gorgeous in pictures. I know it will be awesome to experience! Great tips! What a wonderful vacation for the family.